If you have just had hip replacement surgery, you likely have a lot of questions about what to expect during the recovery and rehabilitation process. The first thing to know is that it is important to follow your surgeon's post-op limitations and instructions very carefully to avoid complications and setbacks as you work to get back on your feet. Secondly, getting back to normal will take time, and taking an active role in your own care, healing, and rehabilitation can help ensure that the process moves along as quickly as possible. 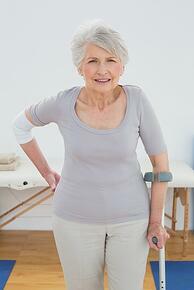 You can expect to spend one to four days in the hospital after hip replacement surgery. Typically you will not be discharged until you are able to do some basic things independently, such as getting into and out of bed, walking with a walker, crutches or cane, and using the bathroom. If your healthcare team feels you are not ready to be on your own yet, a short term stay in an inpatient rehab for joint replacement patients may be recommended for you – a facility that offers coordinated, intense rehabilitation therapy, medical care, and support to speed recovery progress. When you do go home, whether directly from the hospital or after a stay in short-term rehab for joint replacement recovery, you will need some help at home for at least the first few days, but making arrangements to have help available for several weeks is wise. 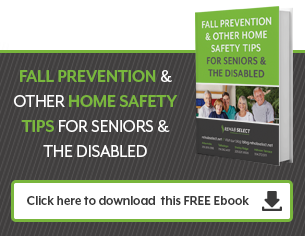 Your home will need some preparation for your recovery as well, including rearranging things to ensure that you can get around easily with a walker, crutches, or cane, removing trip hazards and installing necessary equipment, such as a raised toilet seat, a shower chair, and/or grab bars in the bathroom. Once you are home, you will become largely responsible for your own care. Points that are very important to remember during this time include keeping up with medications prescribed for you – especially DVT medications that are meant to aid in preventing blood clots. Compression stockings are also generally prescribed for blood clot prevention, and wearing them as directed is very important, as is understanding and observing activity and movement restrictions meant to prevent dislocation and other complications with your new joint. Ask your healthcare team for detailed instructions on wound care, including how often dressings will need to be changed and how to do it correctly. Also, ask about signs and symptoms you will need to watch for, such as fever, increasing pain, drainage that can indicate a wound infection, or swelling and pain that could be signs of blood clots – and get in touch with your doctor immediately if you notice any potential problems. Keeping up with therapy appointments and following through with prescribed exercises at home is also very important to your recovery. Rehab therapy is essential to rehabilitating your hip joint, restoring range of motion, strength, and proper joint function, factors that are critical to regaining your mobility after hip replacement. Lastly, if you are not feeling confident that you can manage all these details on your own or feel that you may have difficulty getting the help you need at home, speak to your healthcare team about a referral to an inpatient rehab for joint replacement patients. While more time in the hospital may not be your goal, getting proper care now will pay off in terms of your health and well-being – getting you back on your feet and back to your life more quickly.